Today I have something very special and very cute to share with you all. 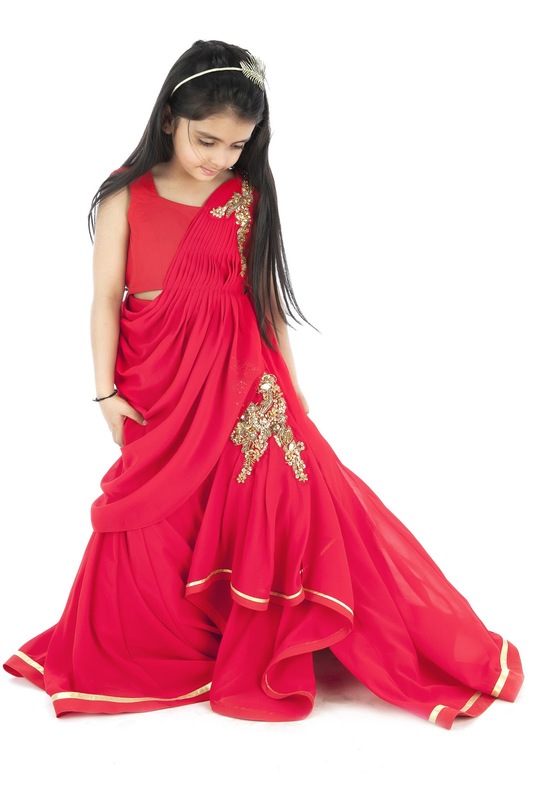 You all know that purchasing a perfect designer wear for your lovely little girl can get a little difficult for you. But can’t get enough of your little girl’s infectiously happy spirit? Give her yet another reason to flash that adorable smile and frolic around with glee! Fill up her wardrobe with frills and thrills from the latest in designer kids wear and watch her blossom in style. This delicate and radiant peplum dress inspires a timeless vintage beauty, perfect for all the little princesses of the world. Give her a taste of vintage glory with classical silhouettes, oversized bows and cutesy peplums. If your little girl’s got a streak of dauntless style in her personality, then the fuchsia & black combo would be the perfect fit for her. But if she’s softer and shyer, then you could go in for the more soothing and subdued options of mint or peach, available in the same design at Kidology. This satin blush hued number is every little girl’s frilliest dream come true! An elegant frill across the off-shoulder piece oozes a sophisticated vintage charm, making your princess glow with beauty. Teamed with a flowery hairband and black or white belles, this fairytale outfit is here to get your little girl party-ready, any time of year! Give your little girl butterflies in her stomach when you gift her this super cute butterfly maxi dress! As a symbol of all things pretty and pristine, the large butterfly print captures her girlhood charm effortlessly. For the more trendy little fashionistas, here’s an absolute must-have. Take a leaf out of the latest fashion lookbooks and dress her up in this chic modish dress. The easy breezy look with drape like frills hits all the right spots this season. And thanks to easy online shopping, you can get the best of high fashion right off the racks. Shop kids clothing online India with Kidology for this chic and quirky dress. Nothing spells girly like bright, big flowers! Give the floral fantasy a bright tinge with this yellow and blush frock. Teamed with pastel belles, this outfit will get your little girls ready to swing into spring or flaunt a vibrant summer tone. Capture cool, casual summer & spring vibes with the beautiful hand-crafted flower and give your little petal the sunshine she deserves. Pulled in at the waist, the silky dress features an exaggerated rose. The elegant flare gives it a sophisticated look appropriate for more formal functions. In this lovely flower dress, your little girl can’t look anything but pretty as a petal! Nothing makes a little girl happier than all things glittery! Add a sprinkle of sparkle to her wardrobe with this dazzling sequinned number. A delicate silky satin lining ensures the dress stays soft and supple on the inside, and glossy and glamorous on the outside. A great option for parties, this glittery party dress is going to make her twinkle bright like the true star she is!